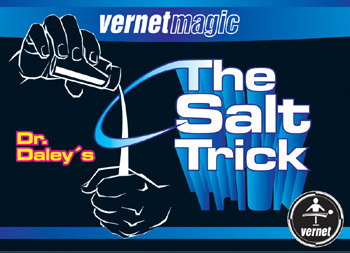 Jacob Daley (one of the “Stars of Magic”) has designed his own special gimmick to perform the classic vanish and appearing salt trick and Vernet has manufactured it with his much known quality. This is the effect: The magician takes a salt shaker from the table and removes its lid. Immediately he begins to pour salt from it into his left fist. After some magical passes the left hand is shown empty.